Non corrosive aluminum tension spring rod available with a chrome OR white finish designed and produced by well-known German brand Kleine Wolke, established in 1968, and is backed by their quality guarantee. 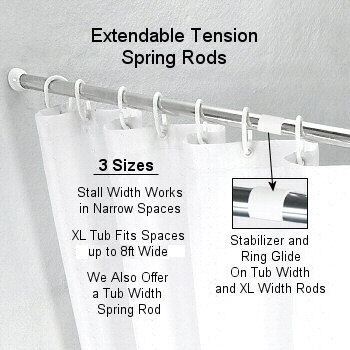 Our tension rod is perfect as an outdoor curtain tension rod, tension rod room divider or tension rod in your bathroom. 1 inch in diameter with white hard rubber end caps. Our spring rods are available in three lengths. See below for details. Pull straight out to extend. NO twisting necessary. Great feature since this rod WILL NOT untwist and fall down. If over extended you can reload tension by pulling it completely apart and sliding the NON spring end of the smaller diameter piece into the larger diameter piece. Stall Width extends from 29.5in to 49.2. Tub Width fits standard tubs and extra wide spaces. This tub width rod extends from 49.2in to 86.6. Tension to 7 feet. Extra Wide extends from 51.2in to 98.4in. Tension to 8 feet.